The thrill of seeing a sailfish jump like crazy is one of the best sights in Key West waters. This game fish has been sought after by many over the years and we do hook a lot of them. 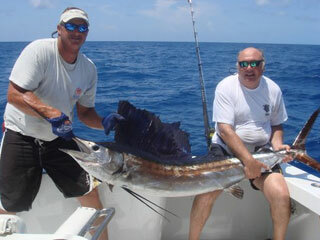 Sailfish are one of the best fighting gamefish that we have here in the Florida Keys. They are beautiful creatures with an iridescent blue sail that seems to "light up" when they get ready to strike a bait. 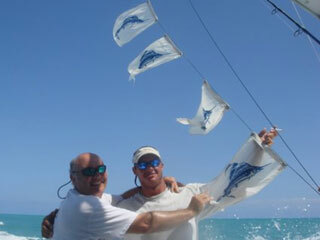 We have many methods of fishing for sailfish here in Key West. Trolling is amoung the most popular and produces great results. Another method is live bait fishing and slow trolling. We do specialize in live bait sailfishing on the Outer Limits and when conditions are right, we can hook many more fish due to our versatility with live bait and trolling methods.